Oshawa, Ont. 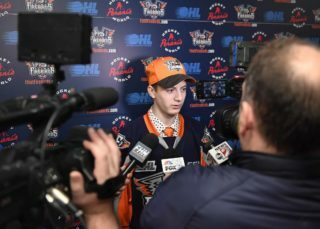 – The Firebirds concluded the first leg of their five-game road trip Sunday in front of a near sellout crowd of 5,198 fans at the Tribute Communities Centre in Oshawa. Flint held a 3 – 2 lead after two periods, but eventually surrendered an 8 – 4 defeat to the Generals. Whitby, Ont. native Ethan Keppen extended his point streak to nine games, scoring in his home-town. Jake Durham also found the back of the net on an assisted play by Ty Dellandrea (Dallas Stars), both of whom also hail from the Oshawa region in nearby Port Perry, Ont. Eric Uba and Kyle Harris also lit the lamp for the Firebirds. Luke Cavallin stopped 34 of 42 shots between the pipes. Anthony Salinitri (Philadelphia Flyers) scored a hat trick to lead the Generals. Keppen logged the game’s first goal, his 16th of the season at 4:29 of the opening frame. Hakon Nilsen made a diving play in the corner below Flint’s goal line that sprung the puck free to Jack Wismer along the right-wing wall. Wismer hit Keppen at the defensive blueline with a head of steam. From the left circle, Keppen snapped a quick shot far-side, beating netminder Aidan Hughes glove-side. Then, Tyler Tullio sent a two-line breakout pass that sprung Kyle MacLean free from the right side of the offensive blue line in. From the inner edge of the right circle, he wristed a far-side shot gloveside for his 11th of the season at 12:53. First period shots favored the Generals 14 – 6. Kyle Harris put Flint back on top with his fifth of the campaign at 2:25 of the second period. Eric Uba and Evan Vierling won battles with defenders in the left corner. Vierling eventually centered the puck to Harris between the circles. His first shot deflected back to him off an Oshawa defenseman, but the rebound allowed him a second shot that hit Hughes in the left shoulder area before bouncing up an over the goaltender and trickled in. At 12:03, Jake Durham scored his team-leading 31st of the season on the power-play. The ‘Birds were in diamond formation with Holmes on the right, Dellandrea quarterbacking from the high point and Durham to the left. Holmes passed to Dellandrea, who found Durham tape-to-tape for the one-time blast. Oshawa closed the gap at 12:53 on Brandon Saigeon’s (Colorado Avalanche) 29th of the campaign, short-handed. He lifted a wrister from the center of the left-wing circle that sailed over Cavallin’s right shoulder. Tullio picked up his second helper of the game on the play. Second-period shots favored Flint 12 – 10. After 40 minutes, the Generals led in total shots 24 – 18, but the ‘Birds were leading 3 – 2. Three goals in the first four minutes of the closing frame propelled the Generals to a 5 – 3 lead. Anthony Salinitri tied the game just 1:06 into the third period, scoring his 32nd of the season. His tally was assisted by Allan McShane. Brett Neumann (Montreal Canadians) scored his 30th at 2:32, assisted by Nando Eggenberger and Giovanni Vallati (Winnipeg Jets). The freshman forward Tullio scored his ninth of the season off a two-on-one at 3:17. MacLean was credited with the lone helper. Then, Mattinen launched the play that resulted in Oshawa’s sixth of the evening. He made the first pass to Saigeon across the top of their zone. Saigeon traversed the right-wing circle then snapped a pass across the slot to Salinitri for the one-timer on the back-door play for his second of the night and 33rd of the season at 11:28. Flint’s Eric Uba scored his 16th of the season at 14:54, assisted by Hunter Holmes. His wrister from the center of the right circle found twine far-side. The Generals’ second power-play ended the same as first, when Serron Noel (Florida Panthers) netted his 25th of the season. Salinitri and Mattinen assisted. Finally, Salinitri earned the hat trick with 10 seconds on the game clock. Cole Resnick and Nico Gross (New York Rangers) assisted on the game’s final tally. Final shots were 42 to 27 in favor of the home team. Flint scored one power-play goal on two chances and Oshawa converted on both of their opportunities. The Firebirds will continue their five-game road trip this Friday against the Rangers. Flint will travel to Kitchener Thursday for a 7:30 p.m. (ET) tilt the following night. 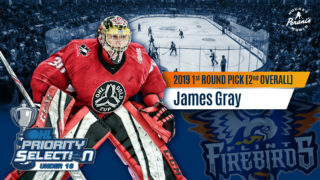 The game can be can be heard live on the radio throughout Flint & Mid-Michigan on US 103.1 FM, online at www.us103.com or by downloading the US 103 app here. Dominic Hennig will call the play-by-play action on the Flint Firebirds Hockey Radio Network. Pregame coverage will begin 30 minutes prior to puck drop at 7 p.m. The game will also be televised live in Kitchener on channel 20 / 510 (HD) for Rogers TV cable subscribers. 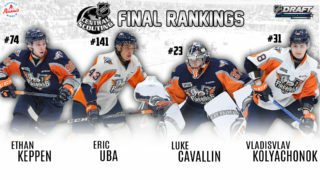 In addition, the game will be televised live province-wide across Ontario on the OHL Action Pak on channel 458 for Rogers TV cable subscribers and channel 489 for Cogeco TV cable subscribers.